The Leesa mattress comprises 3 film layers totalling 10 inches in height, providing sleepers with the most comfortable and revitalizing good night sleep. Regardless of what sort of sleeper you are, the Leesa mattress caters to all. The mattress made its way to the UK in 2015 following overnight success in the USA and has since been an remarkable competitor in the market. Despite not being around for very long Leesa has smashed sales targets and has been included in the Independent’s 2017 best mattresses list. 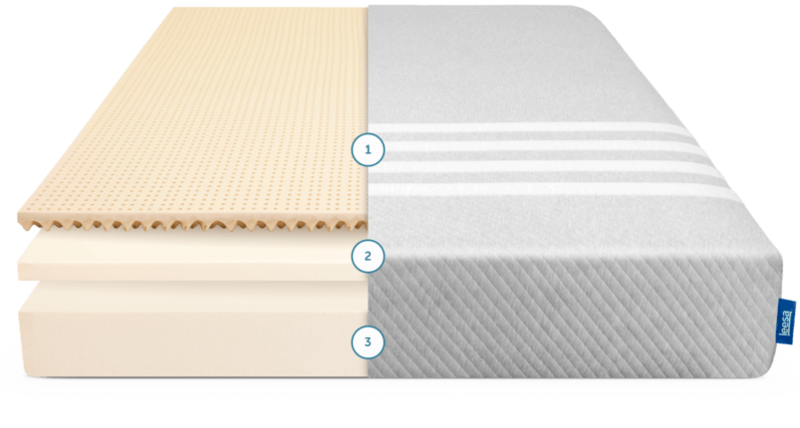 The Leesa Mattress is an amalgamation of 3 separate layers of foam which provide incredible density. Avena Foam (2in) – Springy latex like foam designed to allow user mobility. The layer provides small holes on the top to enable air flow throughout the mattress to prevent overheating. Memory Foam (2in) – The memory foam consists mainly of polyurethane a chemical which The enables higher-density memory foam to soften when in contact with body heat, allowing the foam to mold gently around the human body. Poly Foam (6in) – The foundation base layer of the mattress which provides supports for the sleeper and prevents them from falling all the way through to the bed-frame. Leesa gets very good reviews across the board. Leesa have free next day delivery. Once the order is placed, the Leesa requests 3-5 business days to build and compress the mattress before boxing and shipping it directly to you. Leesa mattresses are shipped from Glossop in the North West of England using UPS. Leesa provides a 100 Night Guarantee as well as a 10 Year Limited Warranty, however both are voided once the Leesa mattress leaves the US, Canada or the United Kingdom. Leesa mattresses are covered by a 10 Year Full Replacement Limited Warranty. For 10 years after a new mattress is purchased, when it has a defect covered under the warranty, Leesa will replace or repair it. This includes all parts of the mattress which are deemed to have a defect, and there’s no deductible. This warranty however, is valid only for the original purchaser from the date of purchase. If the original purchaser sells, or otherwise ceases to claim ownership of the mattress, then the subsequent owner accepts the product “as is” and “with all faults” present. Leesa unfortunately won’t take away your old mattress, however they will help you arrange for pickup by a charity or a local recycling centre. Overall the Leesa is a very popular mattress, and with good reason. It not only looks great but it feels great, providing sleepers with a unique feeling of comfort that is dissimilar to a lot of other mattresses currently on the market. The way the Avena foam creates a firm upper layer which contrasts the slower responsive memory foam makes for an interesting combination. A combination which you can count on to send you into a deep and reinvigorating nights rest. Though minor criticism may stem from from varied customer dissatisfactions with the comfort of the mattress, they still make up a relatively small proportion of customers who have been outmatched with overwhelmingly positive reviews. When you combine the 100 day trial period, 10 year warranty with a sub-£700 price point along with free shipping and an extra £50 discount it’s hard not to give Leesa it’s dues. On this product Leesa has well and truly went the extra mile to secure that sometimes hard to attain customer satisfaction, and for this reason above all, it rightly so deserves the acclaim. Can I trust Leesa? How long have they been around for? Well, truth be told not very long. They are indeed very new to the industry, but they have made substantial progress in a relatively short time frame and for this reason I would recommend them to almost anyone.